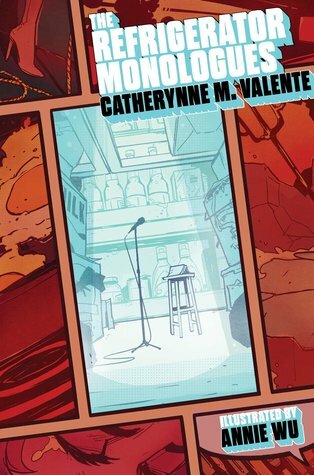 Catherynne Valente tackles gendered superhero tropes with this collection of six stories. The girls of the Hell Hath Club are dead, but they’ve found each other for company is the strange expanse of Deadtown. They gather together, drink Styx water, and commiserate about their lives and deaths. Superheroines, girlfriends of superheroes, supervillainesses… they all got the short end of the stick. I’m not super knowledgeable about comic books. I’ve seen some movies, read a few issues of Ms. Marvel, but that’s pretty much it. However, I could still tell which comic book characters most of the dead girls were supposed to be. The first one, a scientist who accidentally gives her boyfriend superpowers, is clearly based off of some girlfriend of Spiderman. The extremely powerful, only woman on her team heroine with psychic powers sounded a lot like a certain X-Man. An off kilter villainess with an impressive but misplaced loyalty to her man could be no one but Harley Quinn. Another’s the wife of Aquaman, not quite dead but slipped out of her asylum to search Deadtown for her murdered son. Of the six women, there were only two I couldn’t connect to any Marvel or DC characters. One is the famous girl in the fridge, who I’ve heard of before but don’t know much about. According to other reviewers, the last is a riff off of Karen Page, who I only know from the Netflix series. Each woman gets the chance to tell her story, and short chapters in between bridge the gap from one to the other. It’s not a long book — at only 160 pages, it’s more novella than novel. I think the length was just about right for it. I don’t think there was anything that could be cut, and I don’t see what an expansion would add. At the same time, I was never quite impressed by The Refrigerator Monologues. I think it’s tackling an important subject, but it’s more giving voice to the women stuck in bad tropes than subverting them altogether. There’s not an overarching plot. The women don’t get vengeance or fulfillment, they just get a voice and the chance to share their stories with one another. That’s a valuable thing, but I didn’t find it entirely satisfactory. In the end, I felt like the only really new thing The Refrigerator Monologues was bringing to the table was the quirky, off beat setting of Deadtown itself. Maybe I would have enjoyed The Refrigerator Monologues more if I knew more about comic books. Or maybe my expectations were simply too high. I had a similar reaction, although I rated it higher just because I love Valente’s writing so much. The non-plot didn’t bother me too much, because I think that’s what she was going for. But the whole idea of Deadtown makes me want to read more stories set in that world. I do need to read more by her. I’ve got Deathless on my ereader… Have you read that one? Not yet, but I’ve heard really good thing about it. It’s definitely in the pile to read! I always want to be a fan of Valente more than I in fact AM a fan of her. It is a tragic thing! I love her ideas but then am not wild about the execution, and it sounds like maybe Refrigerator Monologues will be more of the same, as far as that’s concerned. Probably so. I had some issues with execution with Six Gun Snow White too. And I’ve never loved the Fairyland books. I rated this same as you, and felt a similar listlessness for the stories. They were interesting, but at the same time just kind of…there. And agreed with your thought son the world building, I TOTALLY wish we’d seen more of Deadtown! Yeah, I got really excited when I heard about this book but it didn’t really live up to my expectations.